teaching | Mzsunflower's Say What? In response to last week’s post “Responsibility & Meaning of Life” came this response from Wendy. While I personally see these attitudes and attributes in a much wider demographic than ages 18-24… I share her concern with the future of any society that doesn’t succeed in teaching accountability(and living it). So the question before us is this – “What is the best way to teach personal responsibility? We were created to be loved. Things were created to be used. 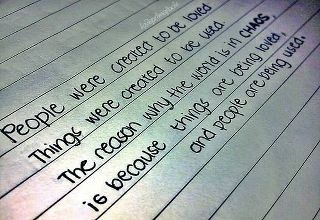 The reason why the world is in chaos is that things are being loved and people are being used. So let nothing or NO-thing create chaos in your life. Do what you were created to do… love and lead…and lead with love.